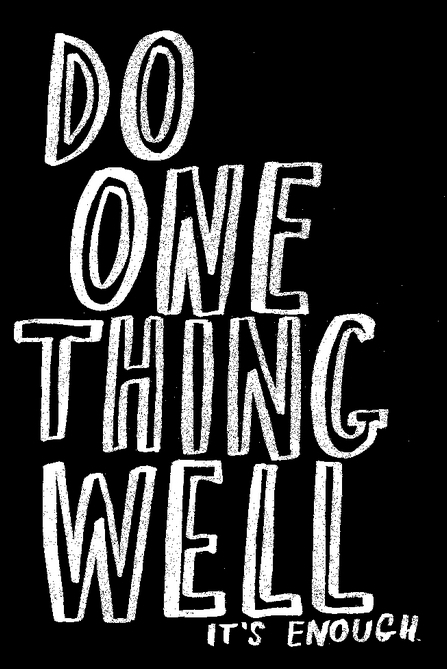 Why is it best to do one thing really, really well? The more you do something, the better you get at it. You’ll be able to solve the problem better than it’s been solved in the past and please more people with your solutions. You’ll discover tricks you’d never imagine that help you create and deliver a better “thing”. Focus on the customer and all else will follow. Inject your passion into your business. You can’t make it to the World Series if you don’t love baseball, and your company can’t become a force in your industry if you don’t love it. Once the novelty of entrepreneurship fades, you’ll need to infuse your business with your passions in order to keep you striving to win. Build your entire offer around your product or service. This will give you a focused niche reputation, fewer management issues, less customer confusion, fewer capital costs, and the opportunity to be the best at the one thing that matters in building a viable and sustainable business. So ask yourself: What do I enjoy? What do I do purely because I love it? Whether your “gold medal” is a specific growth rate or an award-winning company culture, any business will benefit from a leader who trains to win with focus and passion.